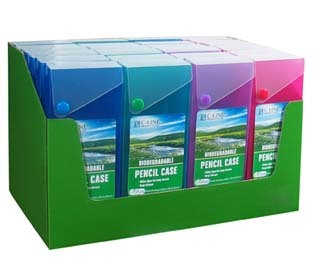 Durable polypropylene case slides open for easy access to pens, pencils and more. * Learn about ASTM testing and the time and conditions it takes for these products to biodegrade. Because of the wide variation in landfill systems, actual timing may vary. Incidental parts (snap closure) are not expected to biodegrade.